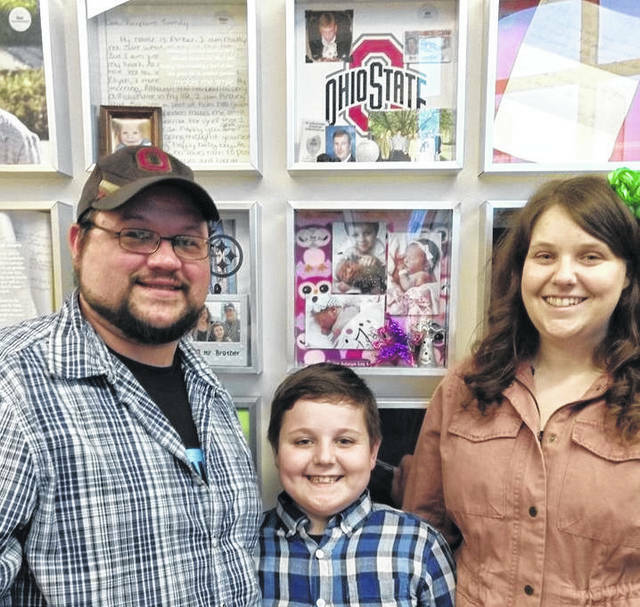 The Loy family of Delaware stands in front of baby Zoe’s shadowbox located inside Lifeline of Ohio’s headquarters on Kinnear Road in Columbus. Pictured, left to right, are Andrew Loy, Parker Loy and Kimberly Loy. Pictured is Zoe Loy, who passed away in May 2013 from SIDS. The Loys, who call Delaware home, decided to donate Zoe’s organs following her death. The number of registered organ donors around the country continues to rise every year, but the reality is there are still far too many opportunities that pass for invaluable organs to help save others’ lives. Lifeline, a Columbus-based organization, continues to work tirelessly in educating and steering the public towards registering as donors, and although through tragic circumstances, they picked up an ambassador right here in Delaware. Zoe Loy was born six weeks premature in May 2013. 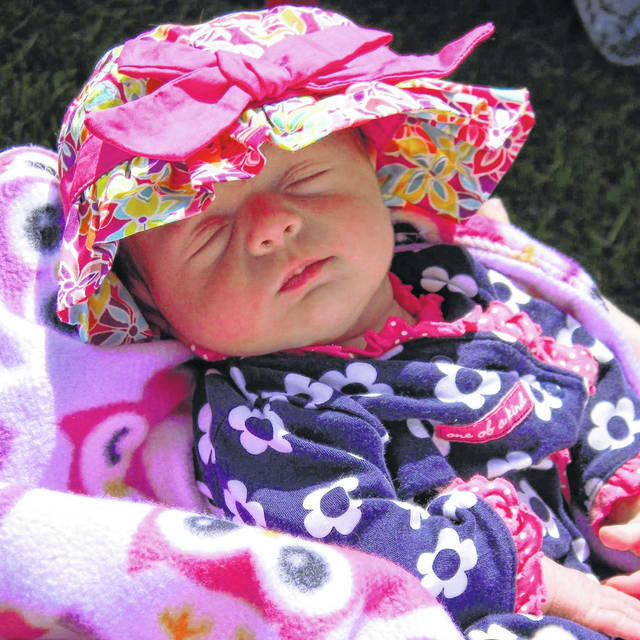 A six-week checkup went “very well,” as Kimberly Loy, Zoe’s mother, described it. Just a day later, Loy and her husband, Drew, woke up to find Zoe not breathing. She was rushed to the hospital where she was declared brain dead. The autopsy determined SIDS to be the cause of her sudden passing. Through the heartache and despair, the Loys had a decision to make as a Lifeline representative asked about Zoe’s status as an organ donor. Loy called the decision difficult, but along with her husband, made the call to allow Zoe to make lasting contributions with her life that was cut short. Zoe’s heart valves were harvested, which will help save lives of children born with congenital heart defects, and her knee tissue will help in the regeneration of new cartilage cells for recipients of all ages. Loy said Lifeline was one of the biggest support systems the family relied on to get through the loss, both initially and even still today. Lifeline is a nonprofit organization which promotes and coordinates the donation of human organs, cornea, and tissue for transplantation. Currently, Lifeline serves 88 hospitals across 37 counties in the state of Ohio, as well as two in West Virginia. Lifeline was started in 1985 and is one of four organ procurements in the state of Ohio. Its headquarters is located on Kinnear Road in Columbus, near The Ohio State University campus. According to Lifeline, only 58 percent of residents are registered organ donors, although that number is much stronger here in Delaware County, where 71 percent are registered. Loy and her husband were not registered before Zoe’s passing. She said they held the misconception that it cost the family of the deceased money to harvest the organs of a loved one, a misconception that is hardly uncommon. Among other popular misconceptions, Lifeline makes it a point to address that doctors will not let a patient die in order to harvest the organs, and there is no age limit to when someone’s organs may be donated. In April, Lifeline of Ohio hosted hundreds of visitors to their Donation Memorial adjacent to their building on Kinnear Road for a candle-lighting service on National Donate Life Blue and Green Day. Zoe’s name was engraved in the Donation Memorial, and a shadow box in her honor is also featured inside Lifeline’s headquarters. Recipients can contact Lifeline to get in touch with the family of a donor, and Loy hopes she can meet with some of the people Zoe’s organs were donated to. The national list of patients waiting on an organ has grown to 114,883 as of the beginning of April. According to Lifeline of Ohio, there are more than 615 patients right here in central Ohio who are awaiting an organ transplant at any time and hundreds more who are awaiting tissue or corneal transplants.